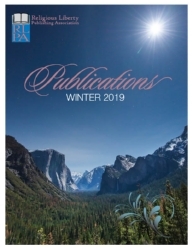 The Publications catalog for Religious Liberty Publishing Assn. is published every quarter. Select the PDF file below to print or look at the current catalog. To receive a catalog by mail when it is sent out, send a message from the Contact tab with your name and address. To see items available in the Store, including quantity discounts available, click on Store, and select the item(s) of your choice. Feel free to order online and pay with a debit or credit card. You may also order by sending an email to info@sda1888.org, or phone 916-765-3389. God bless you in your personal walk with Him and in your outreach to all in need of Him who come within your circle of influence.